Why is “Liliʻu e” the first hula a student learns? Hula is a family tradition for ʻAnakē Nāpua and her daughters. What are some family traditions that are important to you and your ʻohana? Are there some new traditions you would like to begin? How is Hawaiian hula different from dances from other cultures? 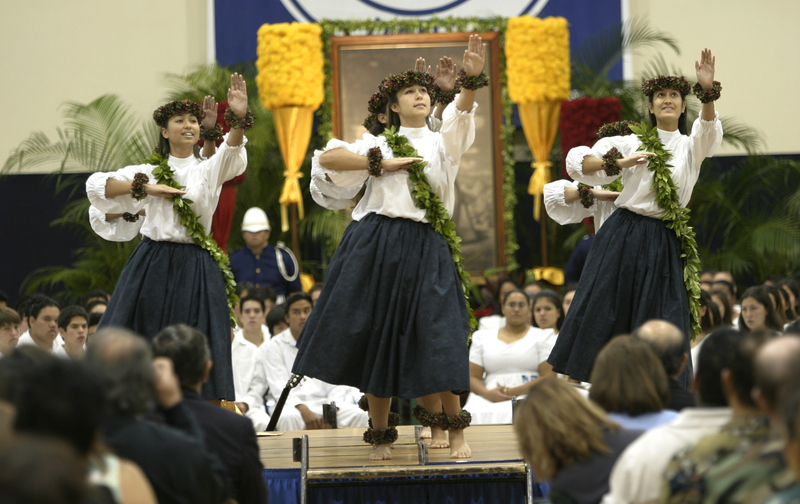 In many of Hawaiʻi’s elementary schools, hula is part of May Day celebrations. Should more opportunities for hula be included throughout the year? Why or why not? Hula requires strength, endurance, skill, and concentration. Think of a person in your class who is part of a hālau. Look at that person’s posture and ways of doing things. Ask about their hula practices and what they do to become strong and focused. Kuhi nō ka lima, hele nō ka maka. Everyone knows about hula. But how much do you really know about this Hawaiian art form? Hula is the dance form of the Hawaiian culture. It accompanies mele, Hawaiian song or poetry. Every mele has a story, and hula helps tell that story. In this way, hula is the physical expression of our thoughts, feelings, and experiences. Hula helps us honor and perpetuate our Hawaiian ways of being. One of the earliest—and maybe the first—schools for teaching hula was established by Kapo at Kāʻana, Molokaʻi. Kapo is considered by some to be the first goddess of the hula and the counterpart to hula goddess Laka. 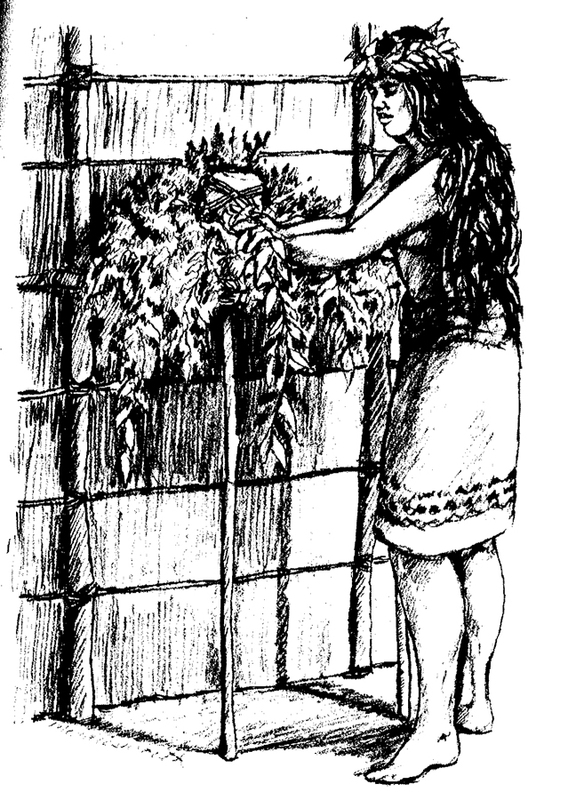 Laka is also a goddess of the upland forest, where hula adornments are gathered. Other akua that are considered to be under Kapo and Laka were also invoked for hula-related activities. Some people wonder if only men danced hula traditionally. But there are stories of men and women, children and elders dancing. When King Kalaniʻōpuʻu announced hula gatherings on Hawaiʻi Island in the late 1700s, the only people not expected to attend were young babies. Older infants, even if they couldn’t yet walk, were expected to be there. Kalaniʻōpuʻu himself was in his eighties and still dancing! Today, as in the past, people of all ages, male and female, dance hula. And even though hula is Hawaiian, people of many different ethnicities and nationalities now dance hula. When you hear “hālau,” do you automatically think “hula”? “Hālau hula” are, in fact, hula schools. But “hālau” literally refers to a long house or meeting house. For example, canoes are kept in hālau waʻa. Hālau hula are beneficial in many ways. Just as in other schools, hālau function as places to learn new things and acquire new skills. Hula practitioners need to know a lot more than just the movements of a hula. Studying and speaking ʻōlelo Hawaiʻi provides a great foundation for understanding mele. Knowledge of Hawaiian history is also very important. Dancers often are asked to make their own implements, so knowledge of construction methods and materials is necessary. Hālau also can function as a venue for storytelling. Performances bring our stories to life. Sometimes these stories live on only through the mele hula and nowhere else. In this way, hālau hula help perpetuate our traditions. Formerly, many kapu were observed during the formal training of a hālau hula. Certain foods were not eaten—like limu līpeʻepeʻe (a type of seaweed) and heʻe (squid)—because their names suggest a hiding (peʻe) and fleeing (heʻe) of the knowledge of the hula from the student. Cutting your hair and nails and shaving your body hair were forbidden because these actions suggest a cutting off of knowledge. Cleanliness was also strictly enforced. So no skipping out on bathing, and please wear a fresh set of clothes! Also, students wouldn’t share their food with anyone other than members of their hālau. Other kapu included not talking back to the kumu, not arguing or fighting, not criticizing the ways of another hālau, and not being physically intimate with a partner. By following the kapu, the dancers would be blessed by the hula gods, retain the teachings, and become better at hula. The most sacred area of the hālau was where the kuahu, or altar, stood. The kuahu was built for Laka and other akua of hula, and on it were placed their kinolau. If no kapu were broken and if the hula training was going well, the kinolau on the kuahu stayed green and fresh—the maile, ʻieʻie, halapepe, ʻōhiʻa lehua, and palapalai would not wilt. The presence of the akua on the kuahu would inspire, grow, and bless the dancers. Today, some hālau follow the traditional kapu. Other hālau blend traditional teachings with their own rules and expectations. Prayers and even hand and feet motions are not all the same among different hālau. So it is important to remember, “ʻAʻohe pau ka ʻike i ka hālau hoʻokahi”—not all knowledge is learned in one school (ʻŌlelo Noʻeau #203). Other akua of the area and ʻaumākua of the people in the hālau might also be prayed to and asked to come and inspire. Without mele, there would be no hula. But with a lāhui full of poetic people who can compose songs for everything under the sun, including the sun, it isn’t hard to find a mele! There are mele for all sorts of occasions. There are mele to express all sorts of feelings. Hula gives depth to these expressions. And hula doesn’t always have to be accompanied by an instrument. The voice itself is an instrument. 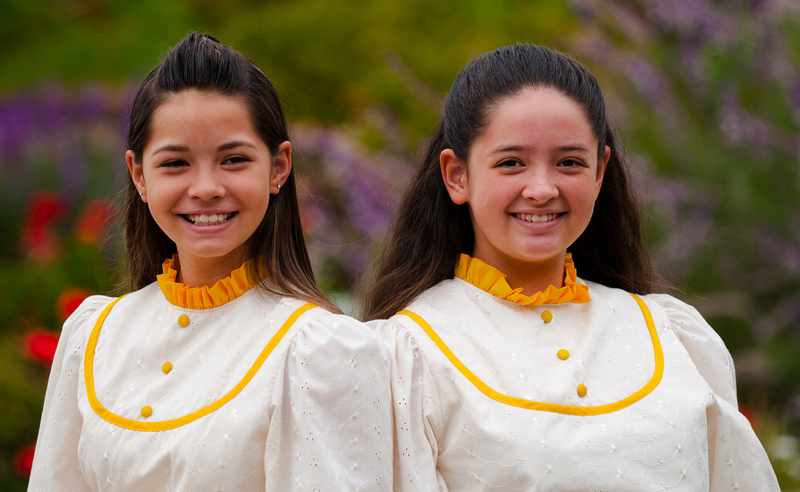 Several old moʻolelo suggest that skilled chanting was emphasized more than skilled dancing. Traditionally, those who were skilled in chanting were often also skilled in hula. Today hula is often categorized as kahiko or ʻauana. 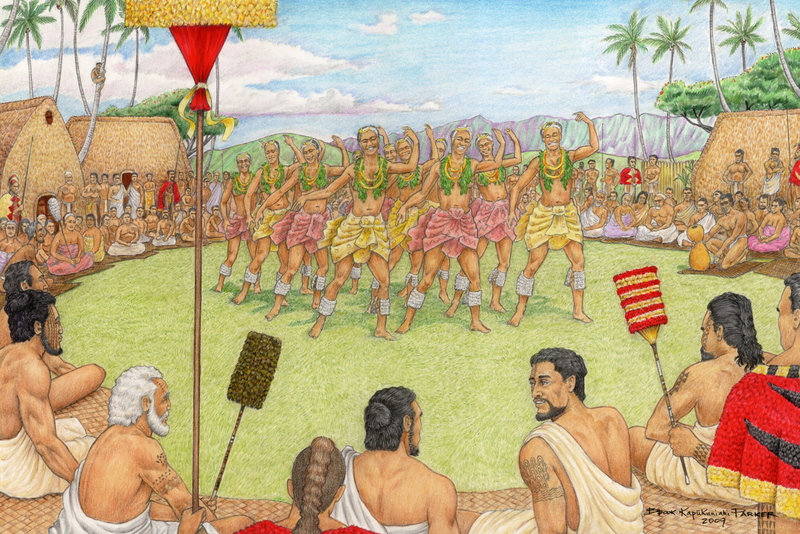 The word kahiko means old, so hula kahiko refers to ancient hula. The word ʻauana means to wander, and hula ʻauana refers to modern hula in which the dance wanders from tradition. Hula students often go into the forests to gather plants for performances and special occasions. If hula students are en route to pick ferns or flowers and you ask them what they’re doing, they may simply say, “I ka ʻohi ʻōpala,” or going to gather rubbish. Students of some hālau don’t say where they’re going or what they’re doing, probably as a means to avoid an unlucky outcome (e.g., not finding suitable foliage or experiencing sudden foul weather). This tradition is similar to the practice of Hawaiian fishermen who say they are going “holoholo” rather than fishing. Before a hula practitioner enters the forest of Laka, a chant is called out asking permission to enter. Some hālau call this a mele kāhea, or calling chant. A response—for example, a sign in nature—is looked for to indicate the acceptance or denial of the request. A similar chant is used in asking permission to enter into the hālau hula, which is also considered a sacred place. If the request is granted, the kumu will respond with a mele komo, or entrance chant. For some hālau, the use of these two mele is opposite—the mele komo seeks permission, and the mele kāhea grants it. If permission is not immediately granted, the student repeats the chant until receiving permission. Entrance into a sacred space requires being mākaukau, or ready. When you are mākaukau, you are calm, focused, and clear of any negative thoughts or energy. By being mākaukau, you are ready to receive the teachings and the gifts. With the teachings and gifts comes responsibility, or kuleana. This is all part of being in a hālau hula. Hula dancers in Waikīkī weren’t the first to earn a living by dancing hula. Traditionally, the finest hula dancers were in the courts of the aliʻi. Their food and livelihood were provided for. Some hula dancers made a living by going from place to place and performing for audiences. Celebrations and other events might call for a hula performance. The biggest occasion for hula was at the birth of a high chief. The death of a high chief would also be an occasion for hula, in which name chants and dances written for that aliʻi would be performed. When distinguished visitors would arrive, it was customary in some places to dance a hula in their honor. It’s hard to imagine Hawaiʻi without hula. There was a time, however, when hula was banned. Among laws prohibiting murder, robbery, and other terrible acts, was the prohibition of public hula performance. Hula had been viewed as a heathen practice by Protestant missionaries. Queen Kaʻahumanu, who was ruling the kingdom at the time, had converted to Christianity. She proclaimed these laws in 1830, along with a law encouraging her people to follow the word of God. Letters to local newspapers condemned the practice of hula. In 1851, a law was passed requiring a license to perform hula in public. And a few years later, the license, which cost $10 for each performance, was available only in Honolulu and Lahaina. Hula was not allowed in any other public venue. Despite these restrictions, hālau hula were still operating, albeit secretly, on all islands. It was during King Kalākaua’s reign that hula experienced its widest acceptance in over fifty years. Through his support and love of hula, Kalākaua helped to bring hula back into the mainstream. The Merrie Monarch Festival in Hilo, Hawaiʻi, is named for him. It draws audience members from around the world every year. Hula is a physical, visual expression of our stories, and therefore our lives. The words and thoughts of our poets are amplified by the dance. Hula mirrors the beauty of nature and exudes the pride we have for our homeland. Hula continues to have high standards. There are rules and expectations within hālau hula. Knowledge shared from the kumu hula to the dancer is cherished. Oneness in body, mind, and spirit is apparent among dancers performing together. The level of discipline required to study hula is similar to what is required for any other endeavor of great value and worth. Excelling in hula requires agility, strength, and good body control. But hula is much more than just the physical aspects. The mele hula are predominantly in ʻōlelo Hawaiʻi, so an understanding of the language is necessary. Chanting is a big part of hula, so a mastery of vocal techniques is honed to produce the different chanting sounds and styles. Lei making is of utmost importance, as lei are used in performances. A good memory is needed to retain the words and memorize the correct movements. The discipline and refinement found in nature is replicated in the hālau hula. Discipline is required of all to succeed in the rigorous hālau setting. Once the dancers have met the rigors of the hālau and their kumu, the spirit of the hula dancer is open to inspiration from Laka or other akua. The hula then becomes elevated to a higher spiritual realm as the dancers are moved beyond their own training and abilities. There is life in hula. Through it our stories and language live on. And when we dance our hula and chant our chants, our Hawaiian world is enlivened—from our ʻāina and kūpuna to our future generations. Hula is a dance of life, and to some, hula is life. It is a way of living and interacting with the world around us with reverence and aloha. Not a bad way to live. Call to the person to enter; feed him until he can take no more. Originally a reply to a password into a hula school. Used later in songs and in speech to extend hospitality. Mānā ripples over the land of Kaunalewa. Said of the movements of a dance. A play on ʻaleʻale (to ripple like water), referring to the gestures of the hands, and lewa (to sway), referring to the movement of the hips. From a password chant used in hula schools. It was often used by one who would like a friendly invitation to come into another’s home. A description of the revolving of the hips and the swaying movements in hula. Let the better-enjoyed hula chanters beat their own drums; this is the hula chant that I know. A retort: Let those who claim to know a lot produce their knowledge; this is what I know.